Many people think they only need to watch out for how much carbs they consume while trying to control their blood sugar. What you should also know is that if you have Type 2 diabetes, a number of factors can affect your blood sugar levels. Your blood glucose levels may change due to an illness and little sleep. Monthly menstrual cycles can also hurt your efforts to manage your blood sugar. What's more, there is a connection a between stress and blood sugar and you need to know about it to manage your condition better. How Are Stress and Blood Sugar Related? Stress – whether it is related to relationships, to work, or to some other aspect of life – can cause blood sugar levels to go up. It happens mainly due to the release of stress hormones, such as cortisol and epinephrine, which raise your blood sugar level to provide you with more energy. It is natural because of the fight-or-flight response. Your blood sugar levels need to be elevated for you to be able to fight danger. However, it becomes difficult for your body to manage this spike in blood sugar when there is already insufficient insulin in your body due to diabetes, which is the reason why stress in any form can contribute to elevated levels of sugar in your blood. There is definitely connection between stress and blood sugar, but what exactly are the risks associated with this? If you have diabetes and are constantly under stress, it will become difficult to manage your blood sugar levels. Constantly elevated blood sugar levels will lead to several health complications, including kidney problems, blindness, and nerve damage, which can cause food numbness and serious infections. Not taking steps to control your blood sugar levels will also result in cardiovascular complications and you will be at a greater risk of having strokes and heart attacks. While stress hormones cause a spike in blood sugar levels, other factors can also make things worse. You may lose your appetite when you are under stress. Many people reach for not-so-healthy food like chips or candy. Some people are different and they start overeating during stressful periods. All these behavioral changes coupled with little to no physical activity will make your diabetes worse. Does "Positive Stress" Affect Blood Sugar Too? Yes, there will be a change in your blood sugar levels even due to positive stress. Emotional stress caused by a breakup or something similar can be emotionally draining. Similarly, physical stress caused by flu or some other health condition can have serious consequences. However, you may still notice a change in your blood sugar levels if you are experiencing "positive stress", which could be related to moving to a new city, planning a wedding, or getting a job promotion. These 'positive stressors' can also send your hormones into overdrive. Knowing about the connection between stress and blood sugar levels is important, but it is equally important to know the symptoms of high blood sugar to be able to take necessary steps. The most common early signs of high blood sugar are fatigue, increased urination, blurred vision and increased thirst. In later stages, you may experience abdominal pain, nausea, fruity-smelling breath, rapid breathing, confusion, weakness, and unconsciousness. Be sure to contact your doctor when you experience early symptoms of high blood sugar or have ongoing diarrhea for 24 hours or more. Similarly, fever that persists for 24 hours, blood sugar readings above 250mg/dl for more than 24 hours, and ongoing vomiting for more than 24 hours are other situations when you should contact your healthcare provider. 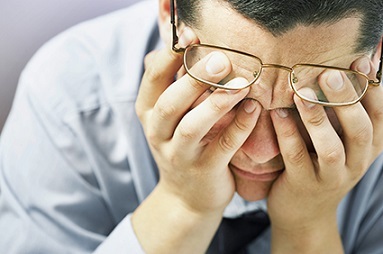 Keep an eye on your blood sugar levels when you are under stress. You will know when you are under stress, and this is exactly the time when you should closely monitor your blood sugar to make necessary adjustment to your diet or medication. Be sure to inform your healthcare provider of any big life changes that may be affecting your blood sugar levels. This will tell them if they should make temporary changes to your medication or try something else. Learn to deal with small stressors in life. Simple lifestyle changes like taking a short walk to clear your mind will help a lot. Try some meditation and breathing techniques to keep stress under control. You may also consider doing specific exercises to make it easier for your body to process glucose. A good workout will also help relieve stress and improve your mood. Sometimes, the best way to get rid of stress is to talk it out. Go have a chat with a friend, family member, or someone you trust. You will feel much better once you have talked about your insecurities and stressors. You can even join online support communities to get in a better position to deal with stress. Develop a better understanding of how to deal with diabetes. It is important to stay organized and never miss doctors' appointments. You should also use at-home blood-glucose monitoring kits to spot any unusual change in your blood sugar levels. Be sure to take steps to improve your sleep quality. You will find yourself dealing with emotional strain when you do not get adequate sleep. Sleep deprivation may also lead to anxiety disorders that will make it difficult to manage your blood sugar level. Keep in mind that getting too much sleep (more than 8.5 hours) may also lead to high blood sugar. It is therefore important to get adequate amount of sleep, which is not too much or too little.